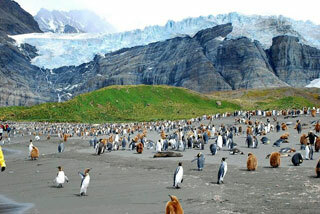 South Georgia and South Sandwich Islands are rugged islands, rising out of the Southern Ocean. There are no indigenous residents, very few people live here and only those who really want to make the trip end up coming. The islands have played a minor role in history, including a brief occupation by Argentina during the Falklands War in 1982, the Falkland Islands themselves being 1000 km (621 miles) to the west. One famous previous visitor is Antarctic explorer Ernest Shackleton, who used the islands as a staging post for his 1914 expedition. He is in fact buried in the small settlement of Grytviken. This article uses material from the Wikipedia article "South Georgia and the South Sandwich Islands", which is released under the Creative Commons Attribution-Share-Alike 3.0 License.